Learn about the four types of hardwood floors for your home. Whether you’re undergoing a whole-home renovation or simply replacing an old floor, there is plenty to consider in the world of hardwood flooring. 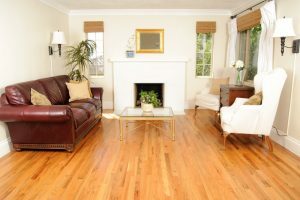 Depending on the room of your house where you’ll be installing the new flooring, the design in your home, the amount of traffic the floor will see, you will have plenty of factors impacting your choice between a variety of hardwood materials. Here are some of the benefits of four of the most common types of hardwood flooring. Solid hardwood flooring is made up of one piece of wood, from top to bottom, regardless of the dimensions. Solid hardwood is available in a variety of thickness options. You also have great freedom of choice in a variety of species of wood, and the ability to have a completely custom, one-of-a-kind floor in your home that can be any number of colors or finishes. Solid hardwood is considered to be a good option for any room in the home, and they can be refinished by a professional 4-5 times, lending to a long life for your beautiful hardwood flooring. Engineered hardwood differs from solid hardwood in a number of ways. Where solid hardwood is made up of a single piece of wood, engineered hardwood consists of layers of wood pressed together and glued. This allows extra stability to be engineered into the wood through alternating grain directions, preventing structural issues in the long-term. Floating hardwood flooring means that the hardwood is not attached to the subfloor, as something like solid hardwood would be. It usually takes the form of a laminate or engineered flooring atop a soft padding layer, which helps to reduce moisture retention, reduces noise, and adds cushion above the subfloor. They are also easy to install, using a click-and-lock system or held together by glue. Acrylic impregnated hardwood flooring is most commonly seen in commercial contexts–especially large-scale ones. This process entails injecting the wooden flooring itself with acrylics. This creates a highly durable wood floor that is perfect for extremely high traffic areas, such as the hallway in a busy office. This entry was posted on Thursday, December 6th, 2018 at 12:14 pm. Both comments and pings are currently closed.